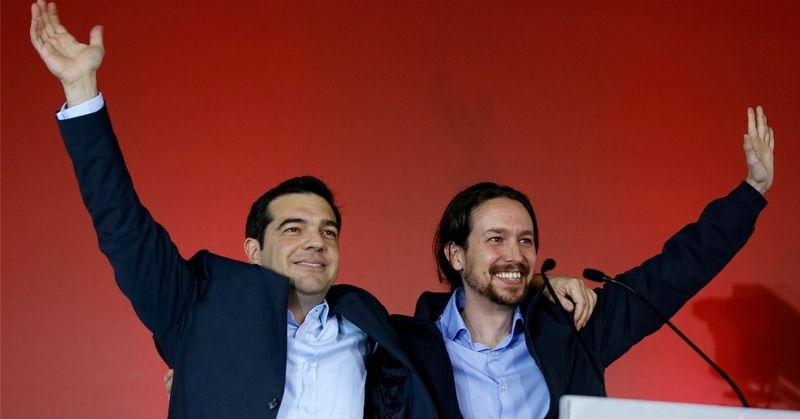 Podemos leader Pablo Iglesias on Syriza and the struggle for a better Europe. Syriza’s expected victory in tomorrow’s Greek elections is part of a crescendo of anti-austerity movements across Europe. Throughout the upsurge, many formations have connected with one another, secure in the knowledge that they’re fighting the same enemy. Though the approaches of the two parties differ, Syriza’s Alexis Tsipras has developed a particularly close relationship with his counterpart in Spain, Podemos leader Pablo Iglesias, appearing at demonstrations together and conferring in private. The following, translated by Dan DiMaggio and edited for clarity, is a speech Iglesias delivered at a Syriza event in October. Good evening. Change is in the air in Greece. Change is in the air in Southern Europe. Brothers and sisters, it’s an honor to speak in front of you today. It’s an honor to be in Athens just a few months before this country will finally have a popular government headed by Alexis Tsipras. This government will be the first in a series of governments which are destined to recover the sovereignty and dignity of the people of Southern Europe. Brothers and sisters, we are called upon to reconstruct democracy — European democracy — against the totalitarianism of the market. Some will want to call us euroskeptics. To all those hypocrites, I want to remind them today, from Greece, from a country that was a model of anti-Nazi resistance, that the best of the European democratic tradition is antifascism. And that our program to recover our social benefits and our sovereignty is inspired by the example of our grandparents who confronted this horror and fought for a democratic Europe that could only be based on social justice and liberty. Many things unite the Greek and Spanish people to lead a new European project. But today I want to highlight the historic example of our populations in the antifascist resistance and the struggle for liberty and democracy. They’ve wanted to look down on us as “Mediterraneans.” They’ve called us “PIGS.” They’ve wanted to turn us into a periphery. They want us to be countries of cheap labor forces. They want our young people to be the servants of rich tourists. Today we say that we are proud to be from the South, and that from the South we are going to return to Europe and to all its peoples the dignity that they deserve. But I don’t want my speech today to be a compendium of sterile encouragement. We are among comrades, and it’s time now to accept responsibility for the difficulty of the tasks confronting us. I just got back from Latin America. There I was able to meet with Evo Morales, with Rafael Correa, and with Pepe Mujica. I am sure that many of you were excited when you saw State of Siege by Costas Gavras and learned about the Tupamaros. Today, an ex-guerrilla, a Tupamaro, is president of Uruguay. I also met with many government ministers and political leaders. Among them was the son of Miguel Enriquez, leader of the MIR, who died in combat in 1974 in Chile. It was moving to remember the Chilean experience — the experience of democratic socialism to which we also aspire. But upon seeing the son of Enriquez, I remembered what Salvador Allende said to the young members of the MIR: “We haven’t chosen the terrain. We have inherited it. We have the government, but we don’t have power.” That bitter clarity of Allende is something I also found among our brother-presidents in Latin America. What we have ahead of us is not going to be an easy road. We first have to win the elections — and only afterwards will the real difficulties begin. The polls say that in Greece Syriza will win the next election. In Spain the polls say that we have already passed the Socialist Party, that we are competing to become the second strongest electoral force in the country, and that every day we are seen more and more as the real opposition force. We already have more than 130,000 members, and we will leave our constituent assembly next month with our organizational muscle ready. It will be hard, but it’s entirely possible that Podemos in Spain, like Syriza in Greece and Sinn Fein in Ireland, will lead a political change. But it is essential that we understand that winning an election does not mean winning power. To speak of fiscal reform, an audit of the national debt, of collective control over the strategic sectors of the economy, of defense and improvement of public services, of the recovery of sovereign powers and our industrial fabric, of employment policies through investment, of favoring consumption, and of ensuring that public financial entities protect small and medium enterprises and families is what any social democrat in Western Europe would have talked about thirty or forty years ago. But today, a program like this means a threat to the global financial powers. There is a worldwide party that is much stronger than the Third International was. It’s the party of Wall Street, which has functionaries everywhere. These functionaries have many ID cards. Some have cards from New Democracy, others from Pasok, others from Merkel’s CDU, others from the Socialist Party in Spain or France. Juncker, Merkel, Rajoy, Samaras, Hollande, and Renzi are all members of the same party — the party of Wall Street. They are the Finance International. This is why, no matter how modest our objectives are, no matter how wide the consensus in our societies regarding them is, we must not lose sight that we are confronting a minority with a lot of power, with very few scruples, and fearful of the electoral results when their parties don’t win. Don’t forget that the powerful almost never accept the results of elections when they don’t like them. Brothers and sisters, we have a historic task of enormous dimensions ahead of us. What we have to do goes far beyond getting electoral support. We are called upon to defend democracy and sovereignty, but what’s more, we have to defend them on a terrain, like Allende said, that we ourselves have not chosen. That’s why we have to deal with sectarians strictly. Revolutionaries are not defined by the t-shirts that they wear. They are not defined by converting theoretical tools into a religion. The duty of a revolutionary is not to take pictures of themselves with a hammer and sickle — the duty of a revolutionary is to win. That’s why our duty is to get closer to civil society. We need the best with us. We need the best economists, the best scientists, the best public sector workers, in order to manage the administration and carry out viable and effective public policies. Patriotism is not threatening someone, or believing you are better because you have another skin color, or because you speak a language, or because you were born where your mother’s water broke. The true patriots know that to be proud of your country is to see that all the children — no matter where they come from — go to schools clean, clothed, well-fed, and with shoes on their feet. To love your country is to defend that your grandparents have a pension and that if they get sick that they are attended to in the best public hospitals. We also need to strengthen our ties with workers in the public finance office, and all other public offices. Some believe that it’s the leaders who make the hospitals, schools, media, and transportation work. They are not the ones who make sure that public facilities are clean, so that they can be used — it’s a lie. It’s workers who take countries forward. And I know that many who work in public administration wish that people like us were governing, so that they could do their jobs, and that they are sick of corrupt and useless leaders, like we have had up until now. We must finally work together — in Europe and for Europe. It’s not necessary to read Karl Marx to know that there are no definitive solutions within the framework of the nation-state. For that reason we must help each other and make ourselves be seen as an alternative for all of Europe. Winning elections is far from winning power. That’s why we must bring together everyone who is committed to change and decency, which is nothing more than turning the Universal Declaration of Human Rights into a manual for government. Our aim today, unfortunately, is not the withering away of the state, or the disappearance of prisons, or that Earth become a paradise. But we do aim, as I said, to make it so that all children go to public schools clean and well-fed; that all the elderly receive a pension and be taken care of in the best hospitals; that any young person — independently of who their parents are — be able to go to college; that nobody have their heat turned off in the winter because they can’t pay their bill; that no bank be allowed to leave a family in the street without alternative housing; that everyone be able to work in decent conditions without having to accept shameful wages or conditions; that the production of information in newspapers and on television not be a privilege of multi-millionaires; that a country not have to kneel down before foreign speculators. In one word: that a society be able to provide the basic material conditions that make happiness and dignity possible. Pablo Iglesias is the general secretary of Podemos.